as years rolled on. But to return to Fig. 4. The back is more than a little reminiscent of the "Jacobean" "slat back" (of which an example is shown on Plate IV. "Elizabethan"), though the slender turning which is introduced and the framing-in of the "slats," again reveal the foreign influence. In the first place, then, the "cabriole" leg must be noted as a thoroughly distinctive feature, to be encountered throughout the style; and it now behoves us to study the most typical of the variations of that form which we are likely to find in the course of our investigations. In Fig. 1, Plate I., we see the shorter " cabriole " so adapted to answer the requirements of the couch, sofa, or any low seat. Here the proportions are altered, and the whole member becomes heavier in appearance, but even thus it is not without a certain amount of grace of line. This rendering of it is not only to be found in chairs and seats, but is often introduced into cabinet work in cases where the "carcase" is raised from the ground, but not to the same height as is the average chair seat (see Fig. 6, Plate I., and Fig. 5, Plate I IK). 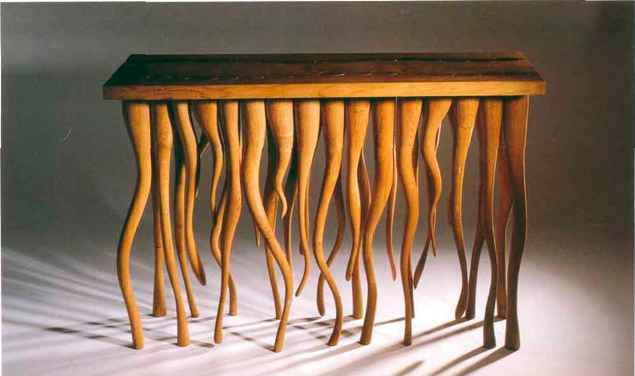 In tables, again, where the length of the leg is always greater than that of the chair, the "cabriole" is elongated, as in Fig. 2, Plate I.; Fig. 5, Plate II. ; Fig. 4, Plate III. ; and Fig. 6, Plate IV. In these cases the proportions of the support are generally much lighter, and the curves far more subtle and often more graceful. If a chair which is "Queen-Anne" in character be found with straight legs, as in Fig. 6, Plate II., and Fig. 1, Plate III., we may be certain either that it is a very early example, or that it is more Flemish than English in origin. Where the straight-turned legs appear they are usually accompanied by under-framing, as in the two examples specified; and the same feature also occurs, but not invariably, in connection with the "cabriole" ]eg (see Figs. 1, 3, 4, Plate I.; Fig. 3, Plate II. ; and Fig. 5, Plate IV. ), consisting of slender, simple turning, interrupted by "squares" where the joints occur.